WASHINGTON - Yazidis and Christians in Syria and Iraq need more support to live safely in their homeland. That was the message Rev. Majed El Shafie delivered to decision makers in Washington, DC this week. Having just returned from OFWI's Syria and Iraq mission to deliver needed medical supplies, Rev. El Shafie was briefing US officials on what OFWI learned and offered his insights to inform assistance to the region. 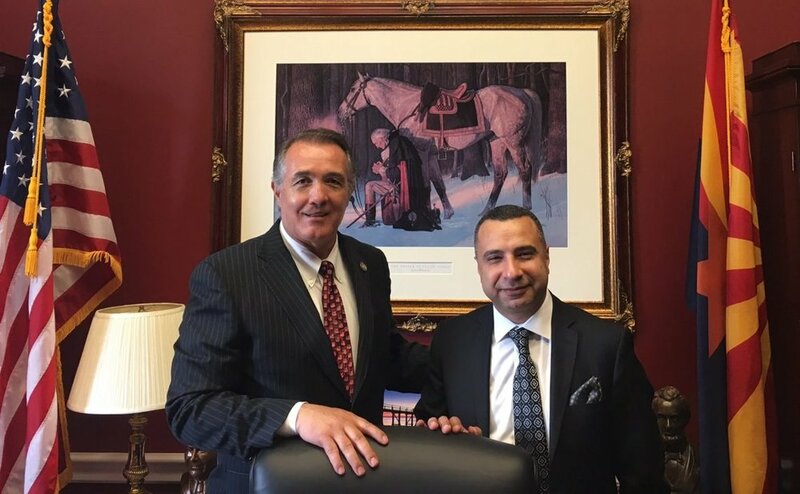 OFWI met with Representatives Trent Franks (R-AZ) and Jeff Fortenberry (R-NE), as well as legislative staffers from the offices of Rep. Eshoo's (D-CA) co-chair of the caucus on religious minorities in the Middle East, office of Senator Risch (R-ID), Chairman on Foreign Relations Subcommittee on the near east and terrorism, and Senator McCain (R-AZ), the Chairman of the Armed Services Committee. OFWI has helped rescue over 400 Yazidi women and girls from ISIS slavery and just delivered 1200 kg of medication and medical supplies that will help save 20,000 lives in Iraq and Syria over the next five months. More support is needed to continue the fight against ISIS to return stability to the region and protect the lives of religious minorities following ISIS's genocide. OFWI also discussed the persecution of religious minorities in China and the ongoing use of blasphemy laws in Pakistan in attacks on the Christian community. Stay informed and help where you can. Click here to sign up for OFWI's Action Alert subscribers list here.